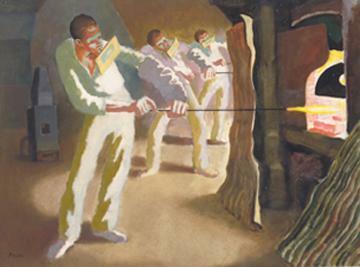 Glass blowers are gathering molten glass as part of the production of cathode ray oscillation tubes. Chance Brothers in Birmingham was the only glass factory in Britain which had developed the technique of blowing this complex shape. The tube was a 19th century invention central to the development of television and radar, and by 1943 7,000 tubes were being produced each week. Peake was fascinated by the manufacturing process and by the balletic skills of the workforce.